So you have implemented a process improvement methodology, like Six Sigma, and it was successful. While this is a reason to celebrate on its own, there’s still more work to be done. One question that pops into mind is: how do we make sure the positive results of the process improvement stick? As an organization, you don’t want to go through a Six Sigma event only to have the promising results gradually revert over time. With that in mind, one thing that becomes clear is that there’s a need for continuous improvement, or as the Japanese call it: “Kaizen.” This means improving anything, whether it is a process or product, on an ongoing basis. When your organization adopts a culture of continuous improvement, all improvements made will become cemented, meaning the organization will be optimized and primed to smoothly deliver value to customers uninterrupted. So how does an organization ensure they build a culture of continuous improvement? Here are six principles to follow. 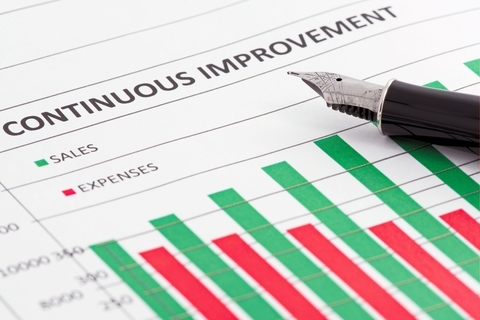 Many organizations think continuous improvement is only about implementing big changes only. But large changes are disruptive and can often face resistance from employees. On the other hand, small improvements, when done incrementally, are less disruptive and more manageable. This means the whole organization doesn’t need to grind to a halt whenever improvements need to be made. Six Sigma has the concept of 6Ms, which are believed to be behind process variation. In every process, there’s an expected amount of variation in output that is considered natural to it. However, there is some variation that is unnatural to the process known as special cause variation. This causes the variation in output to differ greatly to the point of producing non-conforming products. By focusing on eliminating the 6Ms, which are man, machine, materials, mother nature, measurement and method, processes can be improved on an ongoing basis. Nobody likes to make mistakes, especially if they are costly. However, mistakes can also serve as a valuable lesson on what works and what doesn’t. Employees carrying out the continuous improvement effort need to feel that mistakes are part of the process. They must be given enough room to experiment without being reckless and fearing blame. That way, they will feel comfortable in revealing what they did wrong in order to produce the undesirable results. Management should take a top-down approach to continuous improvement. Feedback from employees from the lowest levels should be treated like gold since the further down the chain we go, the more that person is in direct contact with the process being improved. And the more direct their knowledge of the process is, the more they are likely to know how to make effective improvements. It is up to management to listen to what their employees are saying in order to make informed decisions. When the question about who is responsible for continuous improvement is asked, the answer should be that everyone is involved. It doesn’t matter if that person is a janitor, operator, leader or manager. It must be clearly communicated that every employee on every level should take ownership and be involved in all ongoing improvement efforts. Without coming up with a yardstick for measuring success, it would be hard to know if the improvement efforts are working. Process improvement efforts always have an end goal in mind, and results must constantly be measured to ensure the organization is moving towards that goal. Also, by coming up with a way to measure the success, what works can be made apparent for repeatability and what doesn’t work can be eliminated. Making improvements is not an event that you do once and forget about it. It is an ongoing process, leading to the concept of continuous improvement, which the Japanese have dubbed “Kaizen.” While it might seem like too much work from the offset, the benefits of continuous movement greatly outweigh the number of resources you use to instill this culture in your organization. Hopefully, the above-mentioned principles can help. The post 6 Principles of Continuous Improvement appeared first on Shmula.